When I go to Windows photo gallery, I find hundreds of pictures and icons there that I didn't download. I can recognize some of the pictures from websites I've visited. All of these pictures and icons are littered amongst my regular pictures. It takes ages each week to go through them and delete them. How did they get there in the first place if all I did was visit the website? I'm running Windows Vista, Home Premium version 6 SP2 on a laptop PC. I have Norton Internet Security running. In this segment from Answercast #6, I look at the reasons why browser images might be mixed up with personal photos and offer some suggestions on organizing those folders. When you are looking at pictures (when you fire up Windows Photo Gallery), it is opening up on your internet browser's cache. You haven't said which browser you're using, but they all work pretty much the same. 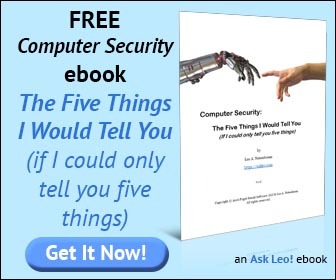 The way your browser works is when it encounters a picture on a website (say the logo on the Ask Leo! website), it downloads it into the cache and it saves it there. When you go visit another page on Ask Leo!, it doesn't have to download that picture again. It's already got it; it has it in its cache. The result is that the second and subsequent pages that you visit on the same site, that may use the same graphics as the first page, all load faster (or they all appear to load faster) because there's a bunch of stuff that was downloaded from the first page that they all reuse. That's all stuff that's kept in the cache. So, Windows photo gallery is opening up on your browser cache. The thing I don't know is how you are getting the pictures that you expect into your cache. Where do your regular pictures come from? If you're downloading from websites or downloading from photo sharing sites, it's very possible that they're being downloaded into the cache as well. Which means that, yes, you're seeing them there because that's where the browser put them. The correct solution to a problem like this is to place your photos, the photos you expect, in a different folder. Download them into perhaps My Documents or My Pictures. Then, instruct Windows Photo Gallery to open on that folder specifically. You can typically do that with a "File Open" operation and it will remember where you had it opened the last time so you may only need to do that once. That way, you place pictures in that folder that are only pictures you expect. All of the other pictures are left in the browser cache; you don't need to see them. They're fine there. They're helping speed up your internet experience. But, by having your own folder of your own pictures, you'll only see what you expect and want to see. Now, the question you're probably asking, "Great, how do I get my pictures there?" See, I can't quite answer that because I don't know where your regular picture are coming from. If you're doing things like clicking on pictures and seeing them, you need to right-click on them and use Save As. If the pictures are coming from your camera, you need to make sure that when they are copied off the camera, they're going into this folder that you have specified and not some other place. So those are the things that you need to be looking at. I do have an older article that actually goes over this as well. It's called "What are all these other pictures that appear when I view a picture from email?" because the scenario here is very common for email. Many email programs will share a browser cache as a location to put temporary copies of pictures that you might be looking at. Next - What is the security related information I need to change to secure an email account? How do I change the location of Windows temporary files? Windows maintains a location where programs can put temporary files. Sometimes you might want to change that location, and it's fairly easy to do so. What are all these other pictures that appear when I view a picture from email? Viewing a picture from email causes the email program to place that image on your hard disk, along side other pictures from other places.